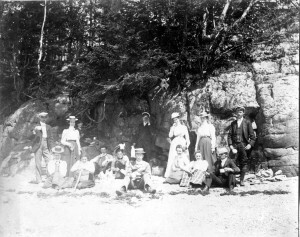 One of the most striking and beautiful places on the St. Croix River is Mill Cove in Robbinston where the Ridge Road, formerly the old County Road, and the old Eastport Road, now Route 1, meet. Going south the view to the left is of the bay, St Andrews, Joe’s Point which marks the mouth of the St Croix River and the remarkable sandstone cliffs which begin close to Route 1 and continue around the point. 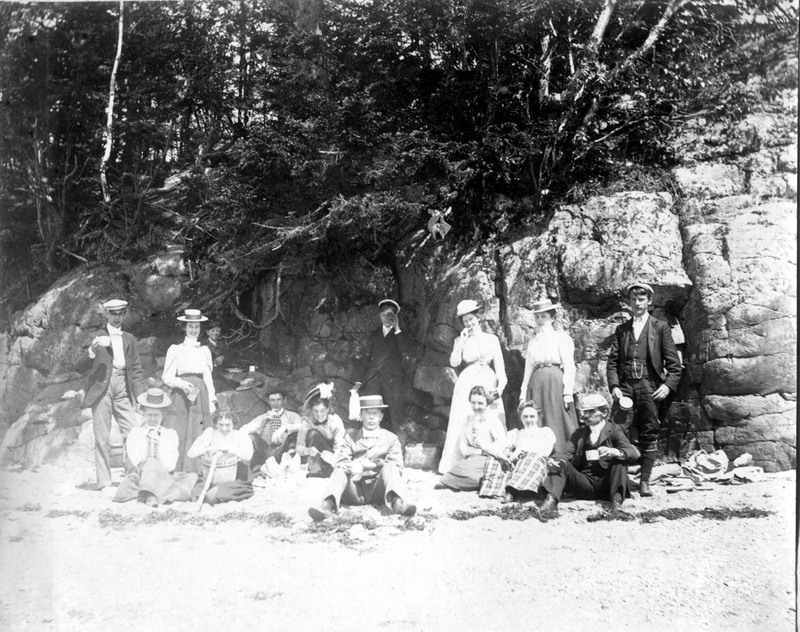 Mill Cove has been a popular picnic spot for well over a century, high school classes and social groups often took the steamship to Robbinston to spend the day at Mill Cove as shown in this photo of some members of the Calais Academy Class of 1898. 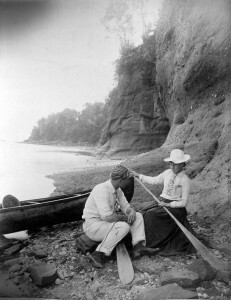 Courting and married couples such as Mr. and Mrs. Frank Todd, of the Calais lumber baron Todds, rowed downriver from Calais for some privacy and time together…. 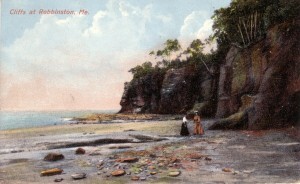 ….and it was the ideal spot for the perfect photo as seen in this iconic early 1900’s post card of two ladies walking under the sandstone ledges. While Mill Cove is lovely the most interesting and distinctive features of the shoreline can only be seen by walking along the shore and around the point towards Lewis Cove in Perry. 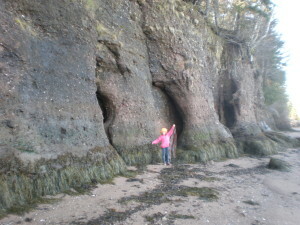 The sandstone cliffs become higher and more impressive, the view a spectacular panorama of the bay and after a fairly long walk along the shore toward Lewis Cove in Perry Pulpit Rock comes into view. 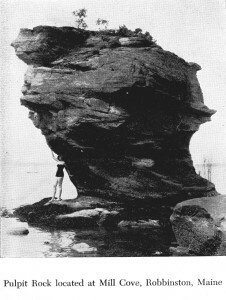 The sandstone cliffs of Mill Cove and Pulpit Rock cannot be better described than by geologist Charles Jackson in Maine’s first geological survey in 1837. Pulpit Rock has special significance to the Passamaquoddies. An article published in 1892 in the St Croix Courier authored by Mrs. Wallace Brown, an acknowledged expert on the tribal language and culture in the 1800’s, describes its importance. January is not perhaps the best time for a hike around the point at Mill Cove to Pulpit Rock but the next warm weekend when the tide is out there is no better way to send an afternoon. 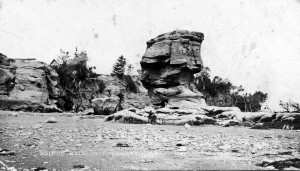 A more direct route to Pulpit Rock is from Lewis Cove which can be accessed from Horse Landing Road off the Gin Cove Road in Perry. However you would miss many of the sandstone cliffs and most of the “elephantine architecture” which so impressed Maine’s resident geologist in 1837. We advise taking a lunch and the long route.